We're very pleased to announce the arrival of PANZER DIGEST, a new wargame magazine published by Minden Games. 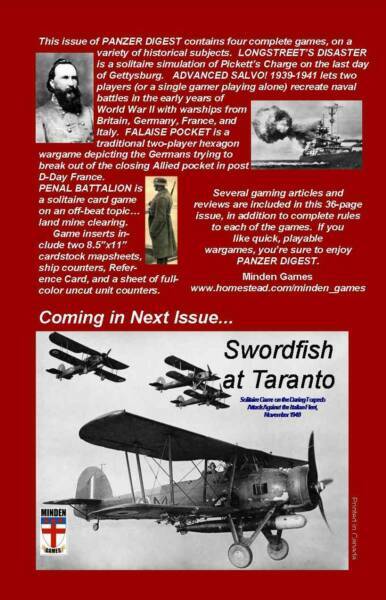 The premier issue contains four small wargames, plus articles and reviews. What's Included: We've got a nice lineup of four games on a variety of topics in issue #1. FALAISE POCKET is a two-player, traditional hexagon, division level wargame covering the post D-Day situation in France (August 1944), with daily turns, each hex about three miles across) pitting the Germans trying to exit troops from closing pocket, and the Allies (Britain, US, Canada, Free France) trying to prevent them. ADVANCED SALVO! 1939-1941 is a solitaire (with two-player option) introductory dice game of ship-on-ship naval combat during the initial years of World War II. Warships from Great Britain, Germany, France, and Italy are included. PENAL BATTALION is a solitaire card game on an off beat topic... land mine clearing. LONGSTREET'S DISASTER is a solitaire design depicting Pickett's Charge at the Battle of Gettysburg, with the player cast in the role of the Confederates assaulting Cemetery Ridge. Scale is brigade level, played on a hexagon map. 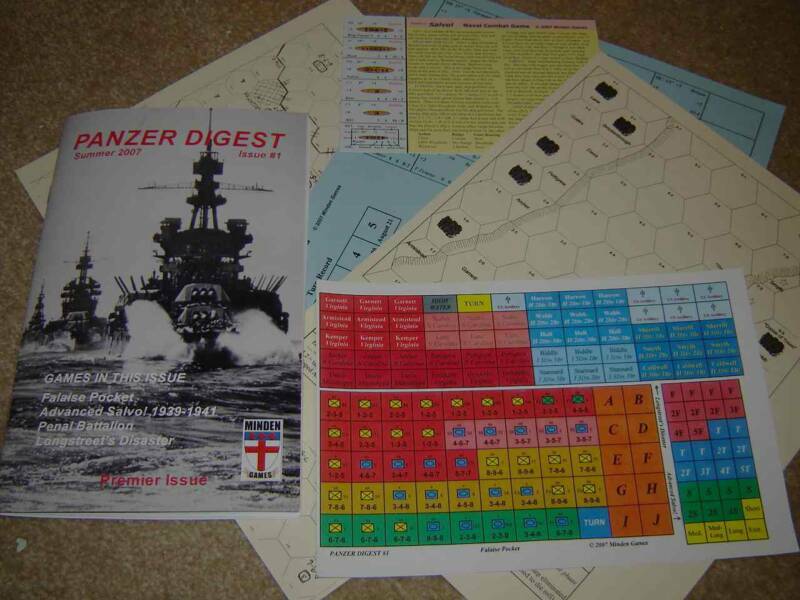 Game inserts include two 8.5x11 cardstock mapsheets (one each for Falaise Pocket and Longstreet's Disaster), Reference Card, ship counters for Advanced Salvo!, and sheet of color, uncut unit counters for the games. Also included is the free promotional game, Salvo!, (the size of a postcard!) upon which Advanced Salvo! was based. The magazine itself is digest sized, professionally printed with full bleed covers and includes full rules for each of the games, plus several game reviews and articles of interest to wargamers. We're VERY pleased with this inaugural edition... and are sure you'll be too. As far as value for money, you just can't beat what PANZER DIGEST offers! PANZER DIGEST is edited by Gary Graber, also the editor of award-winning PANZERSCHRECK magazine. If you like the idea of a magazine written by wargamers, for wargamers, and you relish the thought of small, playable wargames on a variety of topics, you'll love what the DIGEST has to offer. Why not order your copies now? See the ORDERING PAGE for complete ordering and payment details for this and other Minden products. For details about each of the games included in each issue of Pz Digest, click here.